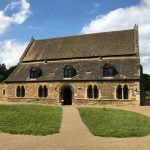 Oakham Castle is known for being one of the best preserved examples of Norman architecture, and is open six days a week to be explored (7 days a week during the school holidays). It his home to massive horseshoes, often made by local blacksmiths, to celebrate visitations from important people, (traditionally royalty or peers of the realm) including Prince Charles and Queen Elizabeth II. The earliest recorded horseshoe was a donation from Edward IV in 1474. A family friendly site, there are fancy dress costumes and colouring-in books for children to use for free. The site is also wheelchair accessible. Local dramatic societies over the years have performed on the site, both inside and outside on the grounds. For example, in 2016, there was a performance of Shakespeare’s Twelfth Night just outside the castle. Earlier in 2017 an audience was able to watch a radio play being recorded, written by a local writer. A true symbol of Oakham, this site is a great place to get an insight into Rutland’s rich history. This is even more accessible since a recent restoration, allowing visitors to a get a sense of the boundaries of the original structure. Nearby landmarks include Cutts Close Park, All Saints’ Church and The Buttercross.